Since Finn McSpool is busy with a DIY project that isn’t quite ready to show off to the world yet, this week seemed like the perfect time for another garden stroll post. Unfortunately, my garden tour took a side trip into the bowels of hell. Or at least it seemed like a fiery inferno when Portland was smacked with a heat wave. Things started out well, not a bit of damnation in sight. While at the home supply store to get the goodies we needed for our DIY project, I couldn’t resist bringing home this new friend for the garden (and for the house when winter arrives). 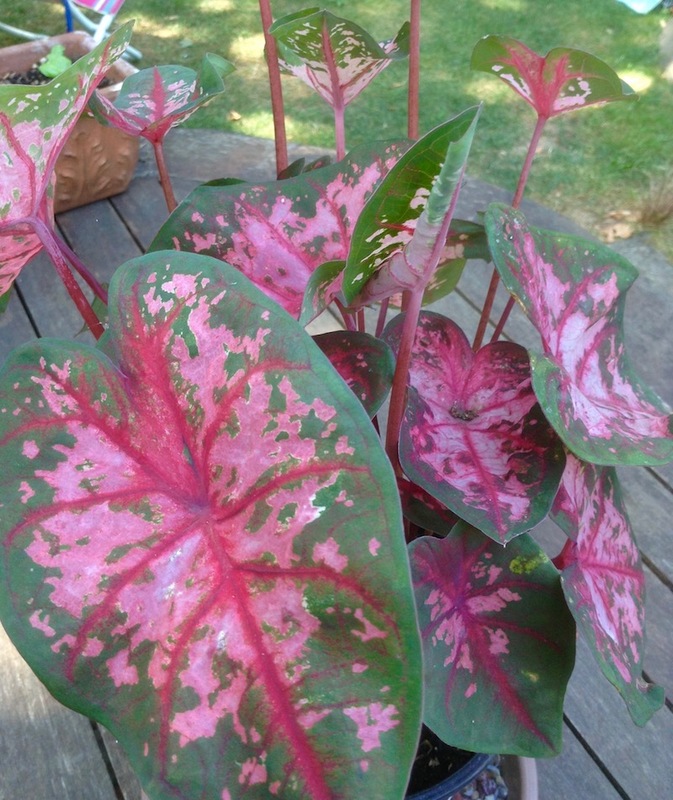 Meet the Flamboyant Miss Caladium. 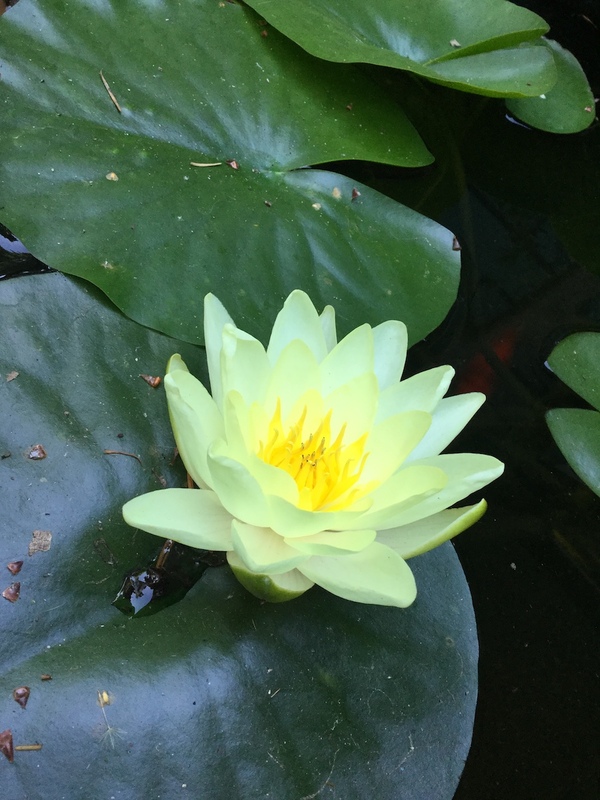 If you don’t think plants don’t try to one up each other, let me tell you, the minute I brought Miss C. home, I think someone wanted to show off her own stuff because Lily, that’s Water Lily to you, popped into bloom the very next day. 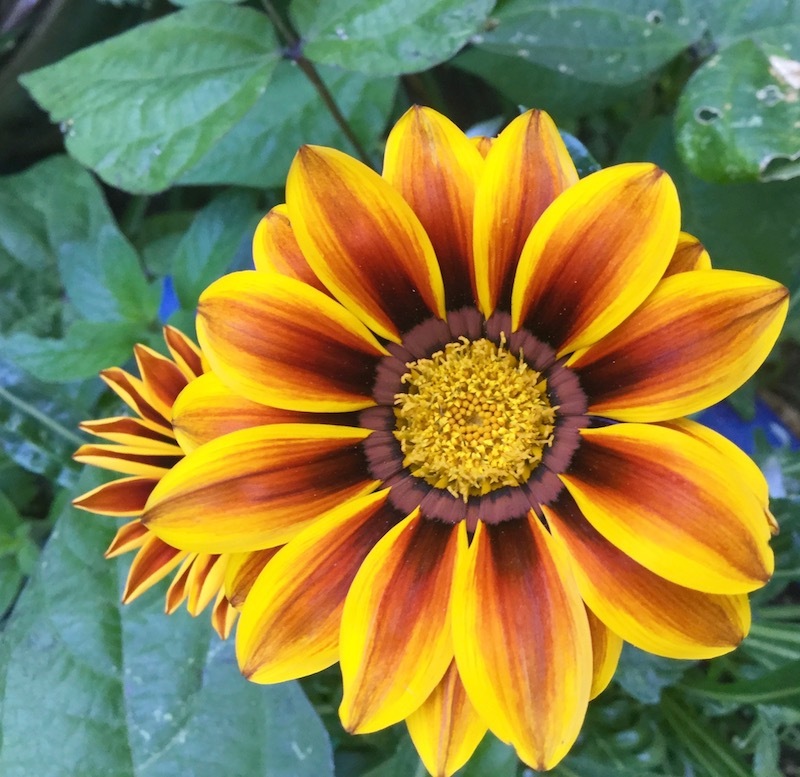 Well, Mr. Gazania Daisy saw what was going on and wasn’t going to be left out, so he decided to show both the lovely ladies up by producing not one, but two flowers in one go. And boy, does he know how to color coordinate! But then the heatwave hit. Normal high temperatures in Portland this time of year are around 80 to 85 (that’s degrees Fahrenheit, not Celsius…we haven’t plunged THAT far into hell). Starting Monday, we soared into the 90s (not the decade), then shot up to 106 by Thursday, which was actually a relief because we had been forecast to hit 111. 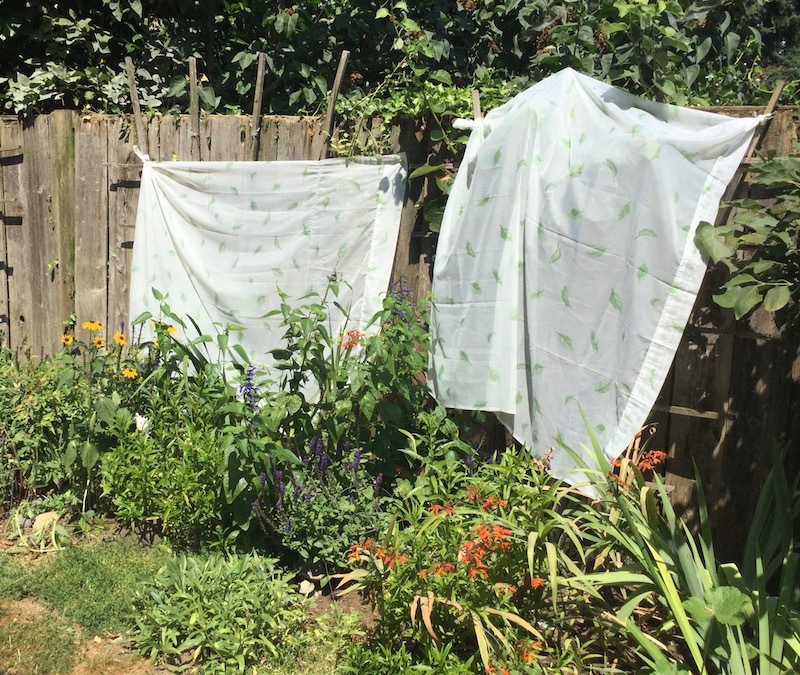 Since a few of my garden plants don’t like being blasted with Ra’s rays to that extreme, it was time for some cover ups. My garden now looks like I’m decorating early for Halloween. First, we have that the distant cousin to ghost peppers, the Ghost Kiwis. And hold onto your hats because lurking near the bee hive is the Haunted Hydrangea! The bees don’t seem to mind living next door to the haunted hydrangea and are actually loving the heat. I think of them as my little solar-powered honey machines. 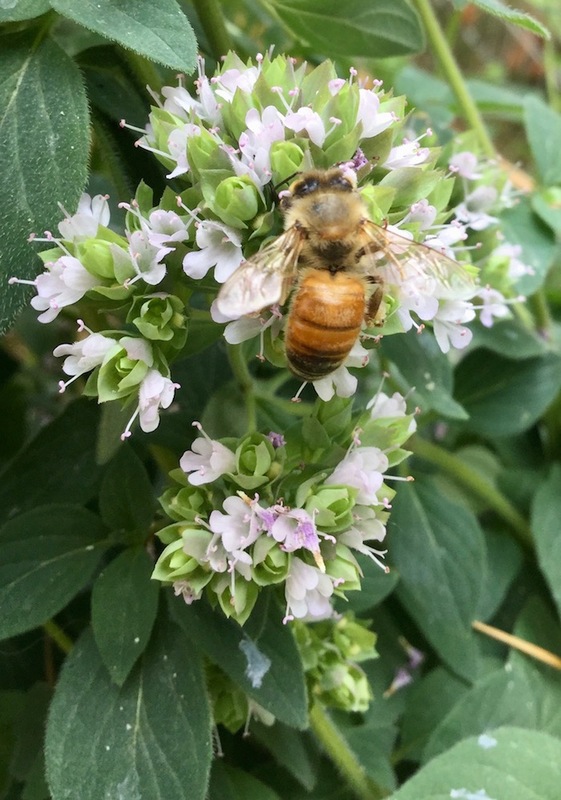 They’re super excited that Old Man Oregano has started blooming and have been hanging out with him most of the day listening to him tell the same stories over and over and over and…but they’re bees, they have short memories. Now, when I say Portland has entered into the bowels of hell, I’m not just talking about the heat. We’re also inundated by the by-product of some fiery brimstone. Okay, it’s actually the smoke from some fires up in British Columbia, but it’s been thick and is making some rather ominous (and very I-imagine-this-is-what-hell-would-look-like) sunrises. However, despite being utterly convinced that we have completely broken the planet, the combined heat and smoke have created some interesting light conditions for snapping photos in the garden. Instagram may want to add a Fire & Brimstone filter to their collection. 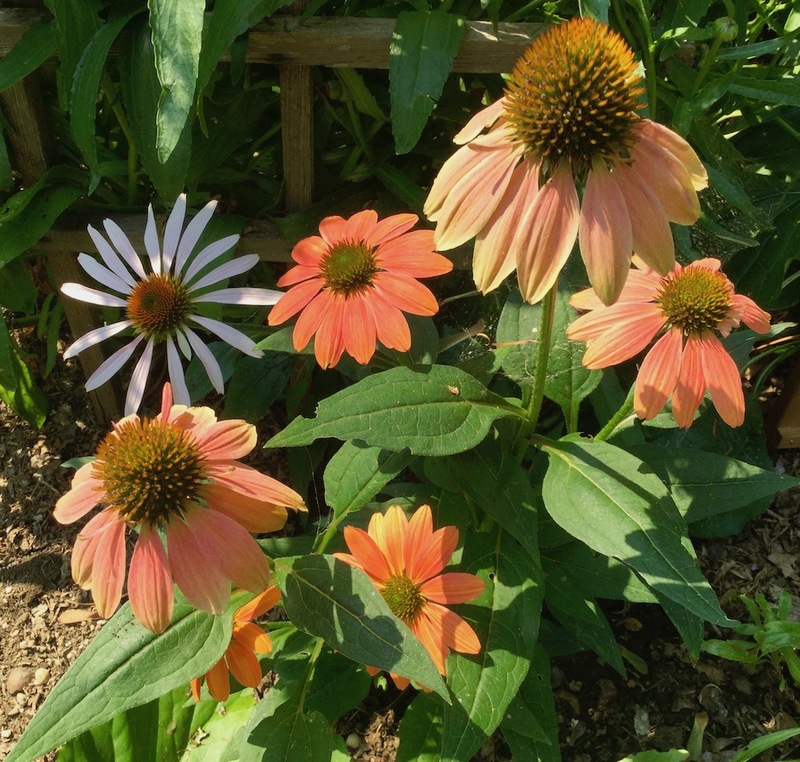 Check out the colors of these orange coneflowers…and the purple coneflower photobombing them. Not to be outdone, when I started getting snap happy with the purple coneflowers, that camera hog Shasta Daisy decided to do a bit of her own photobombing. 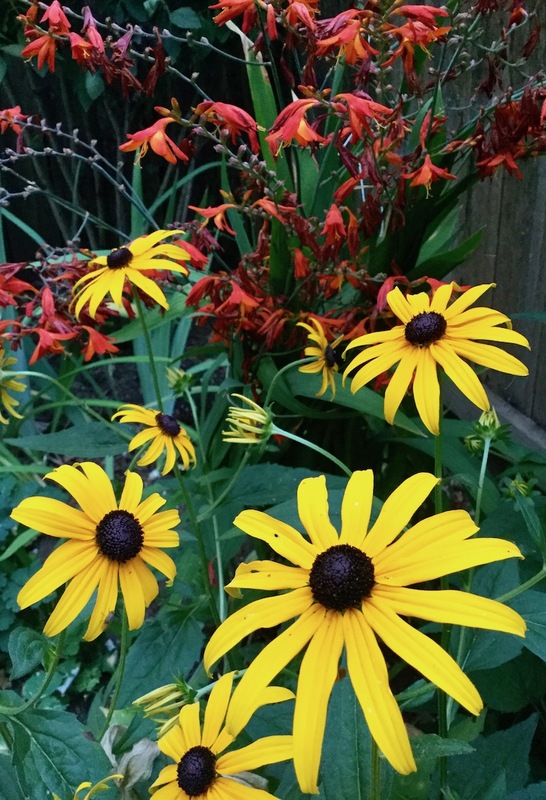 A fight ensued between the three of them, so I dashed over to the other side of the garden to visit the quiet but lovely Black-Eyed Susan who was hanging out with her friend Crocosmia. As far as the heatwave goes, today is only going to be a mere 93, which is practically sweater weather at this point. But then the hellacious temps return and we’re supposed to be in the high 90s, maybe even 100, through all of next week. Anyone who claims climate change isn’t real needs to experience this…oh, and bring me an iced coffee while you’re at it. Hope everyone is staying cool! Next Wednesday I’ll have some new art to show off and, if all goes as planned, next Saturday Finn will be back to show off his handymanbeast “skills.” Oh, and if you need a little dose of Finn to tide you over, he now has his very own webpage, so be sure to head over there and check it out. Previous Post Come See Me On Broadway! 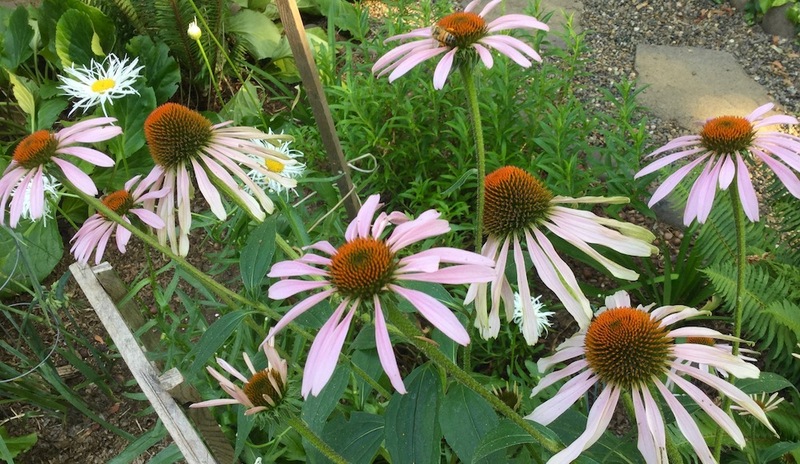 I did have a bit of trouble getting coneflowers established, but now that they’ve settled in they’re doing well. They seem to be one of those pesky plants that want you to beg for their presence. 😋😋 Thanks for coming along on the stroll! Rain! I’ve almost forgotten what rain is. Yes, if you could get everyone in Ireland to set up some big fans and direct them westward, I’m sure you could blow some that weather my way. I think the two temps would average to some very pleasant days. I’ll just thank you in advance so you can hurry off to get this organized. I’m bottling some up right now. Hope you don’t mind a bit of smoky essence with your heat. Wait, is that barbeque smoke? Abort! ABORT! When the Irish climate senses the lighting of a barbeque, it rains more! Sorry, I can only work on the temperature. Cloud dispersal isn’t in my skill bucket. 106….. ARE YOU KIDDING ME?! Oops… I was so upset about that temperature that I send my reply before I’d finished! I grew up in Atlanta, and I still find that completely unacceptable. 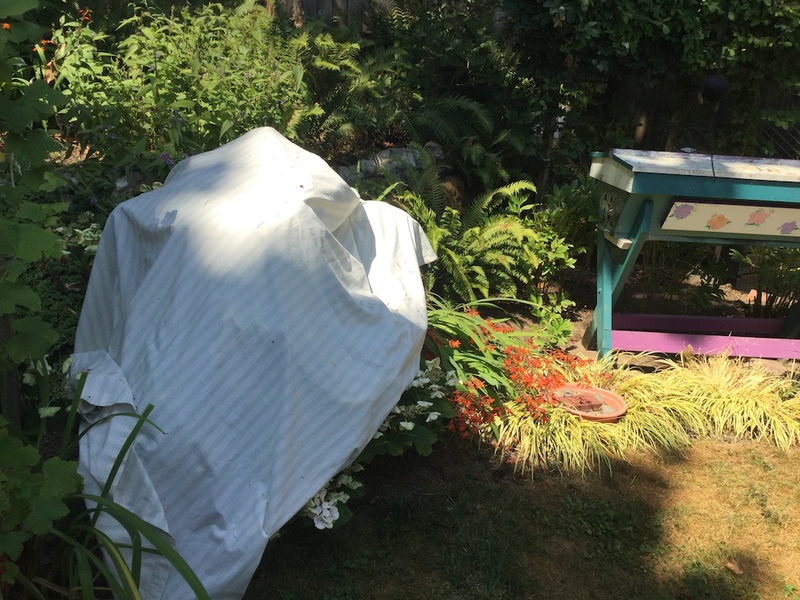 You’re a good person – I would have barricaded myself indoors and left the plants to fend for themselves. Unfortunately, by the end of the day, the house is almost hotter than outside. So, if you’re going to melt, best to do it outdoors where it won’t muck up the floors. Okay, that might be a bit too far in the other direction for my summer temperature expectations! Nope. My sweat glands can vouch for me.